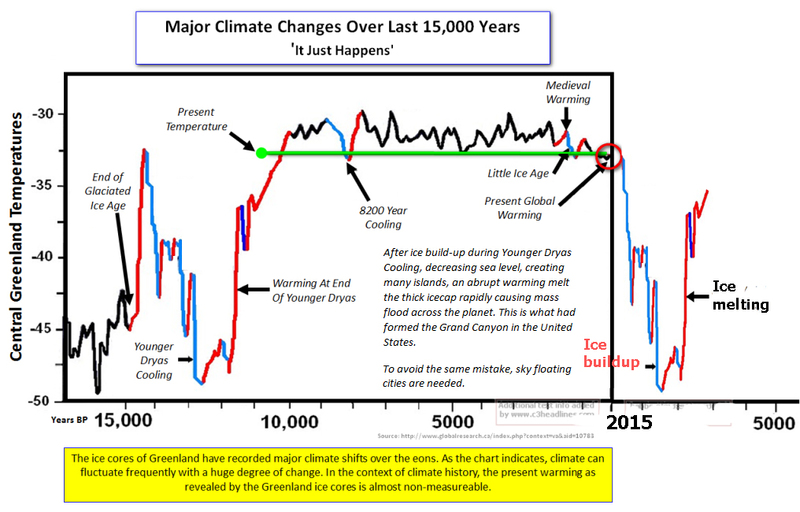 Major Climate Charges Over Last 15,000 Years and prediction. The intensive Government-Corporates' climate modification partnership activities, paid by tax payers to compensate a historic reduction in the energy output of the Sun causes even more colder global, annual atmospheric temperatures, sea temperature and land temperature as sun heat are reflected back into outer space. This table shows the heat storage Capacity generated by the sun by Earth Materials. Water stores energy 6 times more than air. This is important to understand Earth temperature and water cycle, especially how freshwater is created, transported, and where and how it will fall to be used and recycle again. When the distance of humidity transport is reduced by the clouds outside the tropical cyclones zones, outside the monsoon zones and outside the monsoon or rainy season and, outside the modified colder jet stream trajectories, the dryer zones contains less water in the air, reducing heat energy storage capacity of the dryer air as there are less photons bouncing. - The more humid the air percentage, the more water content is in the air, so the more heat energy the atmosphere stores. Increased humidity augments invisible reflections and more photons are bounced back and forth, increasing its quantity and heat. Feel like temperature as 100% humid air store 6 time more heat than air with 0% humidity. The heat storage can be experimented by putting same size tomato and a meatball in the same oven cooking them with same temperature and time and try to eat both of them immediately after cooking. You will be able to eat the meatball quicker than a tomato. This is why the same 30°C (86°F) in Laos with 95% humidity contains more energy than 30°C (86°F) in the US with only 45% humidity. 100% Humidity of air contains 6 times more heat than 0% of Humidity air of the same temperature, pressure and wind speed. - the drier the air, the less heat energy the atmosphere stores, Most sun heat will then pass through the dry air atmospheric layers and will be stored in the next object such as human body, water, rock, desert, vegetated land or buildings. This is caused by less heat energy storage by the dryer air, so the sun energy pass direct to the drier air and stored by the average rock, snow, vegetated land if any, or dry sand. 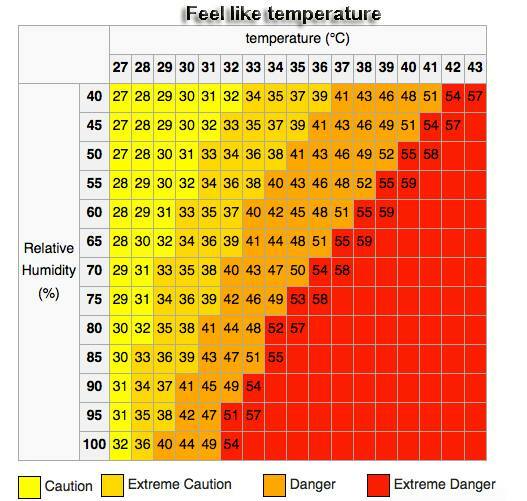 The heat index, also known as the apparent temperature, is what the temperature feels like to the human body when relative humidity is combined with the air temperature. This has important considerations for the human body's comfort. When the body gets too hot, it begins to perspire or sweat to cool itself off. If the perspiration is not able to evaporate, the body cannot regulate its temperature. As human body contains over 60% liquid, body heat is mainly stored in the water. Evaporation is a heat transfer process from water inside the body to the air. When perspiration is evaporated off the body, it effectively reduces the body's temperature. When the atmospheric moisture content (i.e. 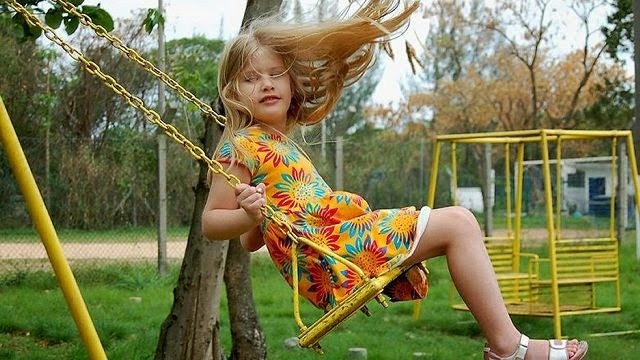 relative humidity) is high, the rate of perspiration from the body decreases. In other words, the human body feels warmer in humid conditions. The opposite is true when the relative humidity decreases because the rate of perspiration increases. The body actually feels cooler in arid conditions. There is direct relationship between the air temperature and relative humidity and the heat index, meaning as the air temperature and relative humidity increase (decrease), the heat index increases (decrease). Now I know why I can't dry my laundry in Bangkok under 30°C (86°F) sun but with near 100% humidity. This is Thone's Non-Commercial, Vertical, Organic, Auto-watering with some hydroponic, planting from seed, UVA&UVB protected tarpaulin Tent covered Office-Leisure-Garden in London. When I install a 40% less transparent tent to cover my garden, during summer, I realized higher humidity inside the tent then outside it. For the same quantity of photons received, the plants grow quicker, consuming more CO2 and releasing more Oxygen because once the water evaporated is contained, air humidity increase and more energy is stored in the more humid air. Plants photosynthesize more, increase humidity further. This is why it's called greenhouse. The same in big scale, on the Earth atmospheric level. Not by spraying chemicals into their air by plane, but by artificially increasing the air humidity just by spraying water into the plants all day long in a warm heated air with light. Plants will grow quicker, more photosynthesis will occur, increasing further humidity and with controlled air temperature to ideal condition for plants to breed in carbon dioxide and expel oxygen. The human brain alone use about 20% of oxygen we breed. The more food it will produce, the greener the planet will be, the more oxygen plants will produce. For that, SEAWAPA is needed. · record low snowfall at the mountain nearby, the main freshwater sources. · dryer air, less water content, less energy storage, less rainfall. This explains why California is running out of water, the result of the worst drought in record, the need for freshwater is only increasing. In order to meet that demand, cities across the US States turn into rather controversial and expensive technology called desalination. This method of high energy usage to produce freshwater will increase food and goods prices, increase national debts, larger inequality gap, making the US less competitive. The cheaper solution will be explained later. there is no cold jetstream passing by the affected region of India, only hot and dry air from the heated Indian Ocean. As temperature soar from heatwave, people seek shade wherever they can. Exhausted by the extreme heat, others cool off whatever they can afford. In most cities, in the East, drivers of the iconic yellow taxis had been urged by their union to stay off the road during the hottest hours between 11am and 4pm. Meanwhile some people are doing their best to carry on with business as usual to maintain their income, despite warning to drink plenty of water and stay indoor which they can't afford so at least 1000 poor people had die. The heatwave is expected to continue well into the coming monsoon, rainy season. For India, there is no feasible solution to develop 1.3 billion people outside SEAWAPA scope to deliver cooler air and water to the region as water stored in Himalayan ice will not melt when temperature is below freezing. "A historic reduction in the energy output of the Sun has begun. The most likely outcome from this 'solar hibernation' will be widespread global loss of life and social, economic, and political disruption. We must begin to prepare for this life-altering event now ! ", said American top scientist John L. Casey. Russian astrophysicist Habibullo I. Abdussamatov has argued that a new mini-ice age has already begun, though Casey doesn't go that far. 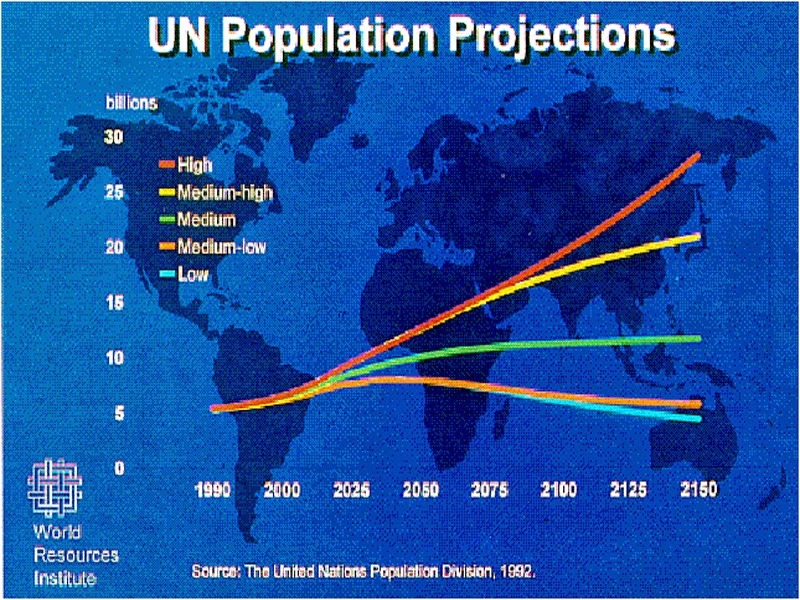 - The Earth population growth to 9.6 billions people by 2050 if no major wars, disease or great catastrophes, (See our slideshow presentation). - Intergalactic climate changes will plunge Earth to Ice age by 2050. - Engineered multipolar New World Order government enforcing multiple solutions to prevent and face above challenges. 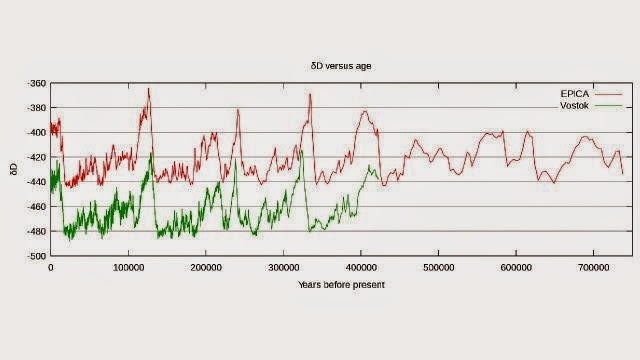 Before 10,000 BC (mainstream), 1500 BC (truthers), the Earth had only between 1 and 10 million people as the agricultural lands were limited between the 40 degree latitudes. There were two types of civilisations; one survived on agricultural disabled zone, dependent on limited food cycle from hibernated and seasonal animal migration, the other group were advanced type living in megalithic cities near water or safe zone. People who survived began spreading across the globe as disabled zone became agricultural lands as we can witness ourselves today. The fall in sea level also affects the circulation of ocean currents and thus has important impact on climate during the Ice Age. Toba volcano has produced the largest known volcanic eruption on earth during the past 2 million years. 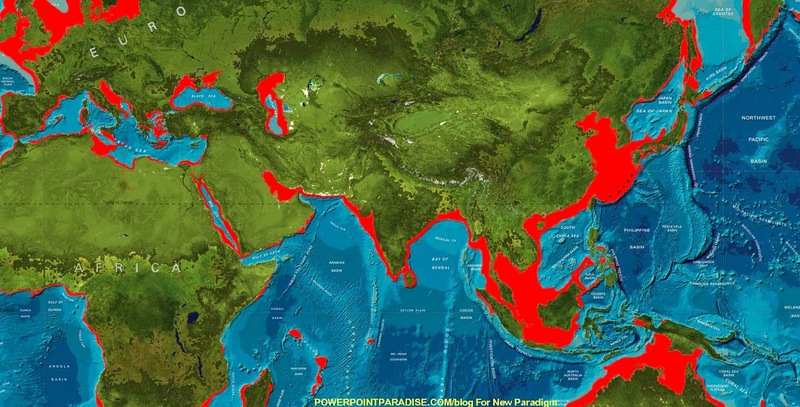 About 74,000 years BP, more than 2500 cubic kilometers of magma were erupted. The eruption led to the final formation of one of earths largest calderas, the 35x100 km wide Toba caldera. Eruptions of this size are extremely rare and are called supervolcano-eruptions. The Toba caldera is in fact the Earth's largest Quaternary caldera. Toba may be triggered by solar hibernation, a chain of event of Ice Age including drop of Earth Population. A preliminary study showed 80.6% of the largest eruptions took place during extended solar activity minimums. Significantly, the eight largest globally volcanic eruptions since 1650, shows all but one took place only during a solar hibernation, or significant reduction in solar activity as measured by sunspot count. This solar hibernation surely modify the Earth electromagnetic fields that trigger Earth movement. Agricultural lands will be again limited between the 40 degree parallels but with much more population than the last Ice-Age. Sea-level will dramatically decreased to the pre-warm period that will render sea ports across the globe unusable, longer sea route or not possible all together as Malacca Strait, Suez and Panama Canals will be completely dried. The South Africa, South America and Bering Strait maritime routes will be blocked by thick ice sheets during harsh and longer winter season. HIGH PREDICTION: After SEAWAPA completion and Earth is at peace, everyone on earth have what they need and the people are highly educated to be advanced civilisation to be spreaded across the Universe. Earth ecosystem restored, managed during Ice-age with people living in harmony with nature. 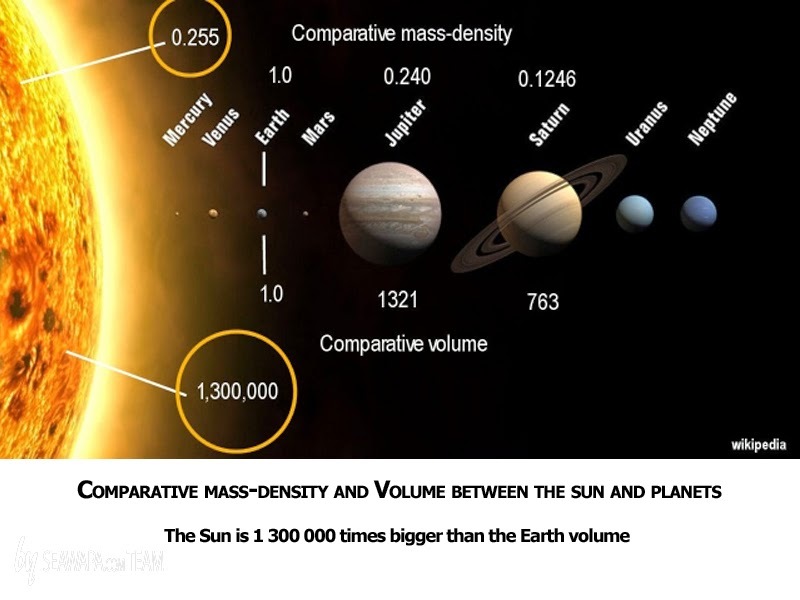 Total population is the number of humans living across the universe. MEDIUM HIGH: After SEAWAPA completion and Earth is at peace, everyone on earth have what they need and the people are highly educated to be advanced civilisation to be spreaded across the Universe. Earth ecosystem restored, managed during Ice-age with people living in harmony with nature. But planetary false-flag scale had occurred and star-war erupted in order to restore and maintain the Jesuit Order controlled Vatican Temple and Religious Power over Mankind. Total population is the number of humans living across the universe, minus disastrous false-flag event and following actions justified by the planned event. MEDIUM: After SEAWAPA completion and Earth is at peace, everyone on earth have what they need and the people are highly educated to be advanced civilisation to be spreaded across the Universe. Earth ecosystem restored, managed during Ice-age with people living in harmony with nature. But SEAWAPA spaceport sabotaged. Utopia society in place. MEDIUM-LOW: SEAWAPA not completed, delayed, under-funded. Earth is at war, everyone on earth continue to be brainwashed, entertained, uneducated and corporations continue to justify the destruction of the planet. 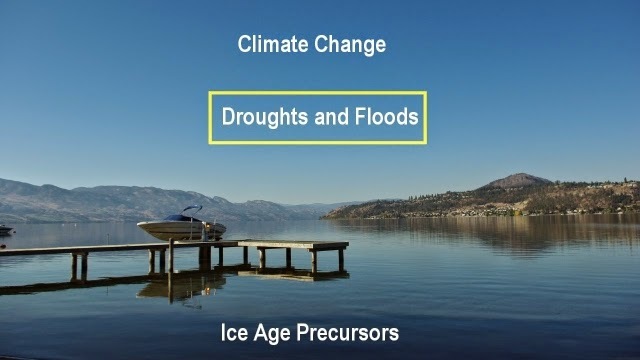 Ice-age caused widespread global loss of life and social, economic, and political disruption. Utopia society, police state in place. Our kids didn't make it not because of them, but because of us. LOW: SEAWAPA ignored. Earth is at war, Ice-age caused widespread global loss of life and social, economic, and political disruption. Whoever survive continue to be brainwashed, entertained, uneducated and corporations continue to justify the destruction of the planet. Return to Dark-Age. Our kids didn't make it not because of them, but because of us. PLAYLIST: Videos of well researched documents about Ice-Age and its consequences. 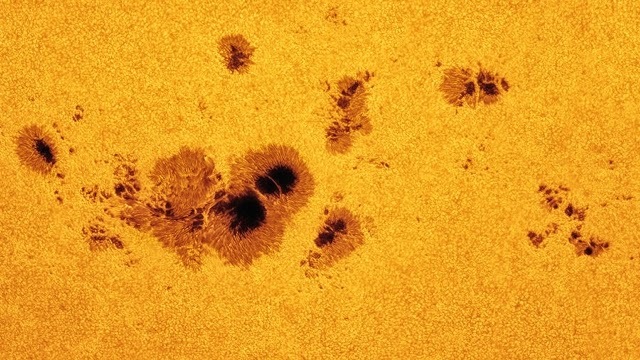 The view we get by looking through the sunspots, at what lays below the active surface, gives us an indication of what we can expect the entire Sun to be like in its inactive state. The vulnerability of the Sun to the presently diminishing plasma-density conditions, appear to be so critical to human living that it becomes imperative for our very existence on this planet that the Plasma Sun model becomes understood as much as this is possible, and be acknowledged as the most critical factor in modern civilization until absolute conclusions can be reached, if this is indeed possible. 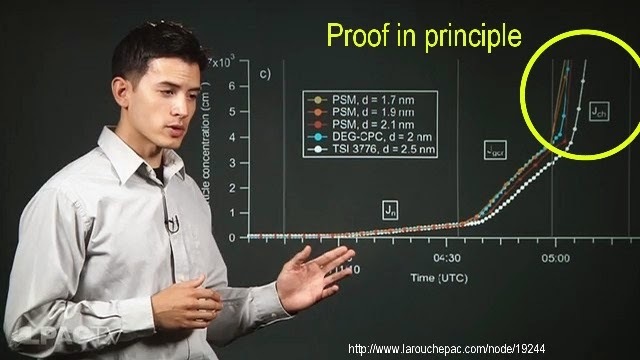 Nothing is more critical in modern civilization than our understanding of the Plasma Sun model, because from the moment on when the Primer Fields collapse and the Sun goes inactive, the Earth will receive potentially up to 70% less radiated energy from the Sun, which emits from this point on only stored-up energy, some nuclear-fission decay energy, and perhaps also some mild forms of energy from lesser plasma-interaction effects. 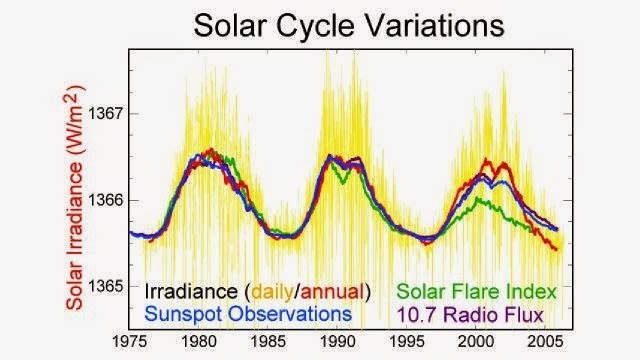 It is obvious that an enormous reduction in solar energy input on earth will result from the Sun going inactive, which will disable agriculture almost over night above the 40 degree latitudes. 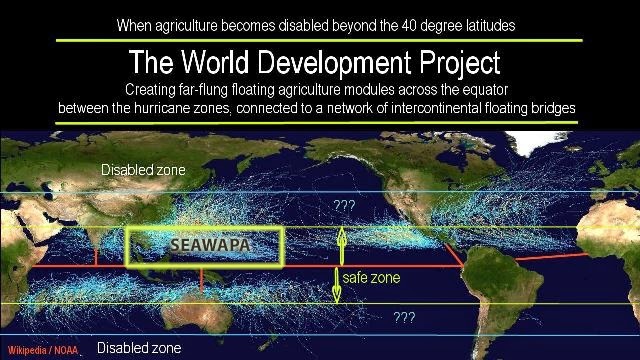 Agriculture might remain possible only across the narrow band between the Tropics of Capricorn and Cancer, centered on the equator, afloat on the sea between the hurricane zones, for the lack of sufficient land near the equator. In order for the affected nations to relocate themselves, 6000 new cities will need to be built in the narrow band that remains liveable on earth with lots of freshwater requirement. SEAWAPA can supply lots of freshwater, electricity, food and access to outer space and the source of the fast transport using the hyper-loop, see our presentation. But will we do it? The science challenge is not a technological challenge, for building the floating cities and agricultural modules. As large as these infrastructures are required to be, the physical task can be easily accomplished with fully automated, nuclear-powered, high temperature industrial processes. The technology exists. The materials exist. And the energy resources exist likewise. No science revolution is needed to implement what we already have at hand to be applied. The great science revolution is needed to inspire us to get the necessary type of building started. While it is widely acknowledged that the world's food supply is rooted almost exclusively in agriculture, in one form or another, it is rarely acknowledged that more than 90% of humanity would die of starvation if our existing food infrastructure became disabled, and no replacement agriculture had been built in protected regions to continue the food supply. The challenge to science is, to get society off the easy chair, and to get the 'spate into the ground' so to speak. In comparison with the task of getting the world mobilized, the actual building of 20,000 kilometers of floating bridges and millions of acres of floating modules for agriculture and cities, and so forth, is easy. To judge by the current rate of weakening in the solar system, it appears that we have enough time left to have the necessary construction tasks completed before the Sun goes inactive, which may occur in the 2050s. But will we do the work that needs to be done? Will we even consider it? Most likely we will do nothing and commit thereby our children to an agonizing death. The answer that we will give to ourselves in this regard, will be determined by our success in overcoming the science barriers that stand in the way, which have become a bulwark of shallow concepts and cultivated opinion, upheld by exotic theories of science 'epicycles' with no real evidence, fundamentally. It appears that we will need to heal science itself, first, before we will consider the needed answers truthfully. The evidence for what would need to be done affects many areas of science. We need to liquidating our North Atmosphere assets, relocate factories and high value resources to between the two 40 degree parallel in process. Example with IBM, in effect what IBM has been doing is liquidating itself - distributing the actual underlying value of the firm to shareholders (via dividends) and to executives (via options), and replacing it with debt via QE beneficial Wall Street banks with near zero interest. It's precisely what many American households did prior to the 2008 crash, by borrowing against the value of their homes and using it to splurge on vacations, boats and RVs. The stocks climbs by the staircase but will fall down by the elevator shaft very soon. Now the Fed is launching Stealth Quantitative Easing through Tokyo, Currency Reset & New Gold Standard Imminent! The US Dollar is fast losing its integrity, during a dangerous global rejection episode. Therefore, QE must be exported, the easy candidate Japan. Call it Operation Tokyo Twist. The King Dollar is in the final death throes, and the entire world knows it. When the new Scheiss Dollar arrives, the wake up call comes. Its painful devaluations will bring price inflation, supply shortage, social disorder, and shock to the gutted nation. The Tokyo Twist will be the song on the FOREX dance floor where all the gals (fiat currencies) are ugly, in a desperate contest to be the least ugly. The new BRICS gold & silver backed currency is at an advance stage in the design rooms, soon to see actual implementation. The Gold Standard is to be re-installed, euphemistically called the Currency Reset. History is on the verge of being made. If we remain stuck in the current trap of shallow concepts and science epicycles, a child may ask in future years as it grows up, "Dad, why do you want to kill us children by not building a world for us that we can live in when the Sun goes dim?" "My child," the father might answer then, "don't be alarmed. The Sun will not go dim." "But you don't know this for certain," the child might reply to such an argument, after it grew up enough to think for itself. "You can't say with certainty that the Sun will not go dim, because all the evidence points against your argument, indicating that the Sun 'will' go dim. And when it does, what happens then? What will happen to us all when you are wrong?" What would a parent answer to that? 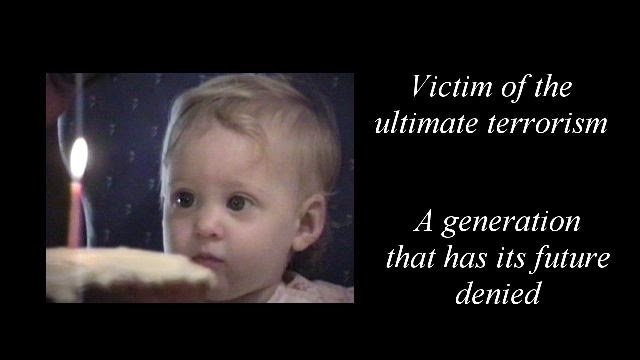 A father might say, "my child, nobody believes the evidence that you speak of, to be what it appears to be." "Oh, is this so?" the child may answer years later when the argument would come up again, and still nothing was done to prepare for the transition in the world that is to come. "I should say the same to you, Dad, about all your fancy theories that you cling to, to explain the impossible that isn't really happening, which you don't even pretend to have supporting physical evidence for, such as the theories of 'electron degeneracy' and the 'tunnelling effect' that you need to justify the internal fusion-sun theory, not to mention the 'dark energy' theorem that you precariously uphold to justify the dark umbra of the sunspots, and other exotic theories like them, such as the 'density-wave theory' that tells you what you observe with a telescope, when you look at the galaxies, doesn't actually exist." What could a dad say to that, if in later years he would face a grown woman, speaking of justice? Would he really believe in 'dark energy' and the like, and brush away his responsibility to be truthful, as easily as he did when he spoke with a child? 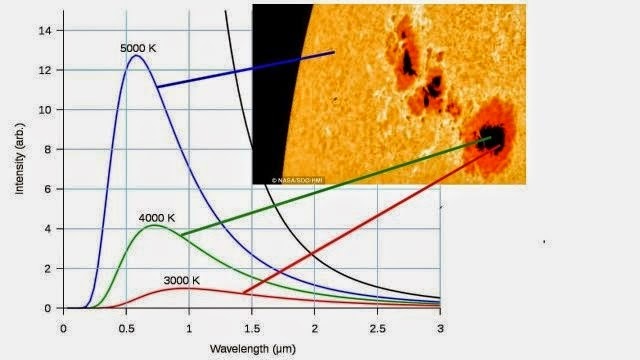 Or would he begin to wonder if the sunspots are dark, because there is simply nothing behind the shiny surface, beneath the sunspots, as he had suspected, instead of the powerful nuclear fusion furnace that supposedly heats the Sun from the inside? Nor would he be able to explain to an educated adult why the Sun is far too light to be an atomic gas sphere of its size. "We don't have all the answers," he might answer his grown daughter, uneasily. "We can only go with what we know." "That's a bad excuse," the adult daughter would say. 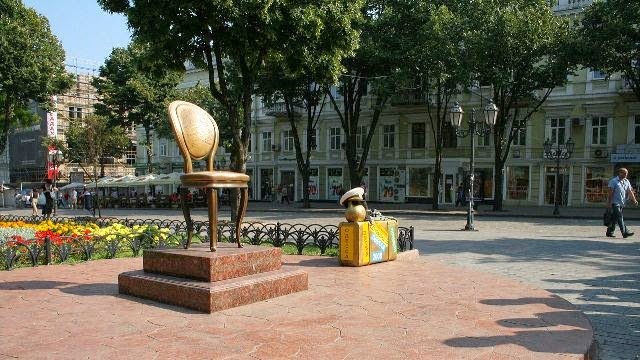 "You didn't get off your high chair and made it your business to know the truth. If you had done this and had acted responsibly, and even if you had erred on the side of caution so that the ice age transition would never materialize that you would have upgraded the world for, then nothing would have been lost, regardless. We would have gained a richer world than we ever have dreamed of. Instead you remained glued to your damn chair and did nothing. Whatever was uncertain before compares as nothing now, with the certainty that we will all starve to death when the Sun goes dim, by which our agriculture fails that we depend on for our food. With this said, how much time do we have still left at this late date to build the infrastructures we need to save our existence? Probably too little. You have squandered too much of the precious opportunity we once had." "If you had only listened when I first raised the question to you, Dad, a long time ago, as a little girl," says the grown daughter to her dad. "It all seemed as like a dream then where nothing is real, and to you it all seemed academic in nature. I relied on you to tell me the truth, but you never did. You didn't have a good answer then, and never had, but you were not honest enough with yourself and with me, to say so. For this dishonesty you have committed us all to death, as have all the men and women whom you have failed to inspire with the truth. You have led the whole world to death, together with us, when the Sun goes dim, by doing nothing towards giving us a chance to have a future." Fortunately, we are not at this point yet where such a conversation would unfold, where we would be condemned by our children. We still have a chance to avoid the condemnation, and treasure and protect what we have in each other. In order that a conversation as the one illustrated here may never take place, I am presenting a summary of the physical evidence at hand, which a child might use in future years to indict us, if we let it come to that. 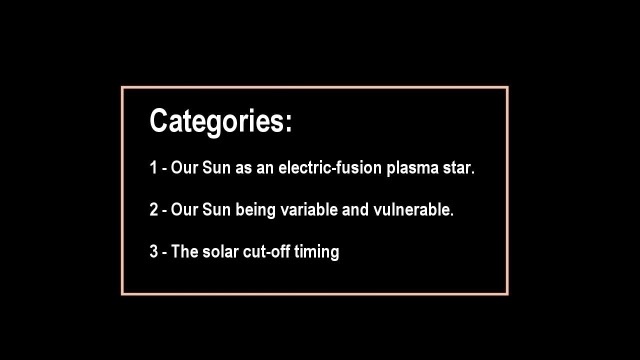 1 - Our Sun as an electric-fusion plasma star. 2 - Our Sun being variable and vulnerable. The plain evidence is that the Sun is dark inside, comparatively, when it is seen through the umbra of the sunspots. It is dark there, below the surface of the photosphere, because there is nothing there to be seen, with the Sun being a plasma star. By focusing on the source of heat, what cause the climate change on Earth, on Mercury, Venus, Mars, Jupiter, Saturn, Uranus, Neptune ? 2. Or the variation of energy output variation from the SUN? The Sun is a plasma electric star, because it is impossible for a gas sphere of the size of the Sun to exist. Its gas atoms would be crushed in the core by its massive weight. In a plasma sphere no such problems can exist. Its mass-density is determined by electric repulsion. 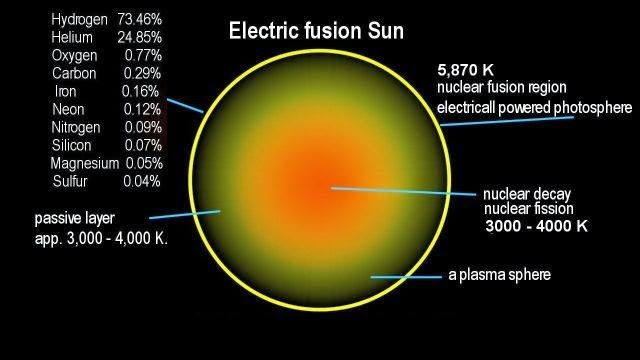 Nor is it possible for the Sun to operate a nuclear fusion process at its core, where hydrogen atoms are said to be fused into helium atoms. The fusion process would blow the Sun out. The core would become clogged with its fusion product that dilutes the fusion fuel, by which the reactions stop. 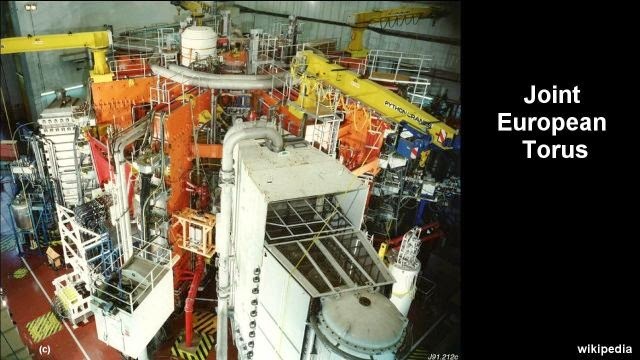 On Earth, the most advanced nuclear fusion reactor, the Joint European Tokomak, blows itself out after a burn-time of slightly less than a single second, for this vary reason. The Sun can't operate on this platform. The Sun can only operate as a plasma sphere with electric nuclear fusion occurring on its surface, from where the fusion products are carried away by the solar winds. The temperature inside of the sun is far greater of illustrated above, beyond million degrees Celsius. 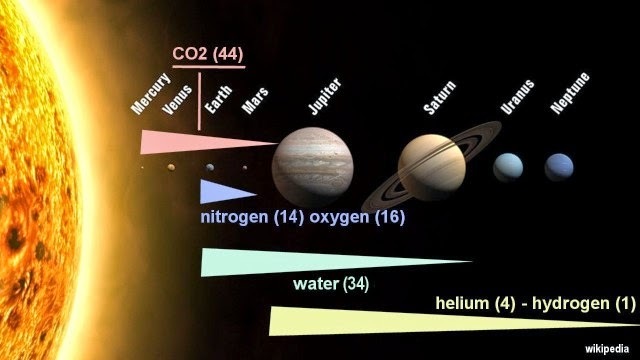 That the Sun is powered by efficient nuclear fusion occurring on its surface, in which all the elements in the periodic table are synthesized, is evident by the unique distribution pattern of the elements across the planets. 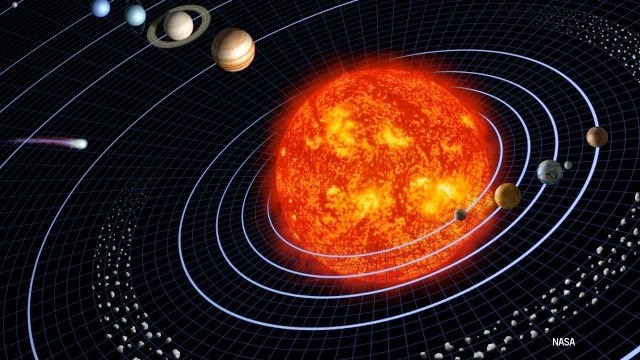 All the inner planets are made up of heavy elements for this reason, which are the first to be attracted out of the solar winds, while hydrogen, as the lightest element, gets carried as far away as Pluto, This wouldn't happen if the Sun was not the central synthesizing source of all the elements, which it is, since all the basic elements have been detected in the solar atmosphere. That the Sun is an electric star is further evident by the existence of the solar wind that is accelerated away from the Sun to speeds of 800 kilometers per second. What we see here, is the natural by-product of the dynamics that enable electric nuclear fusion to occur. If the Sun was internally powered, solar winds would not occur. 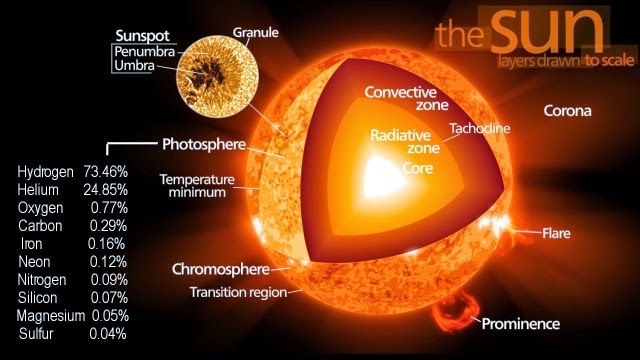 The superheated corona at hundreds of times of the surface temperature of the Sun, would likewise not occur if the Sun was heated from within. 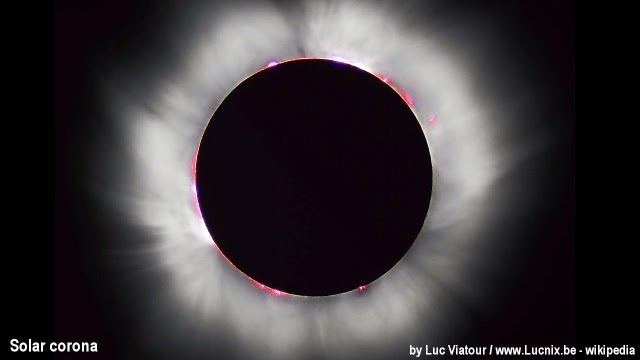 The superhot corona is possible and natural only for a Sun that has a large sphere of highly condensed plasma focused on it, by its Primer Fields. No magic is involved here. 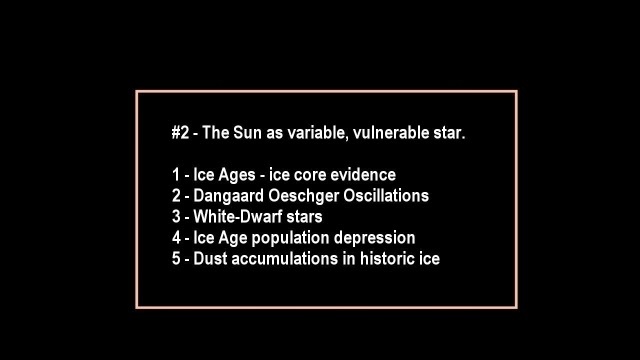 #2 - The Sun as a variable, vulnerable star. The evidence is plain. Ice Ages would not be possible if the Sun was an invariable constant, in the climate 'theater.' We would never have had Ice Ages. Still we had them. 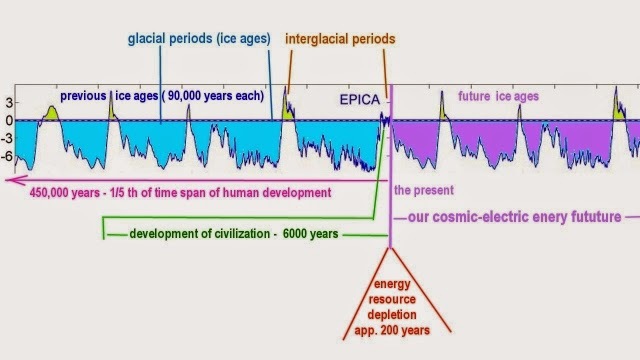 Ample evidence exists that Ice Ages have occurred almost for as long as humanity has existed, spanning more than 2 million years. No actual theory exists for the known Ice Ages to have occurred under a constant Sun, which renders the Ice Ages that we have records of, to be the phenomena of our Sun going inactive, from which Ice Ages result. The Dansgaard Oeschger Oscillations that have occurred all the way through the last Ice Age, which we have ice core records of from two sites of Greenland, are not possible under a constant Sun, but are the natural result of the Sun being inactive all the way through the last Ice Age, with the exception of 25 brief occurrences when the Sun became active for a few decades at intervals of typically 1470 years, and then cooled down again. 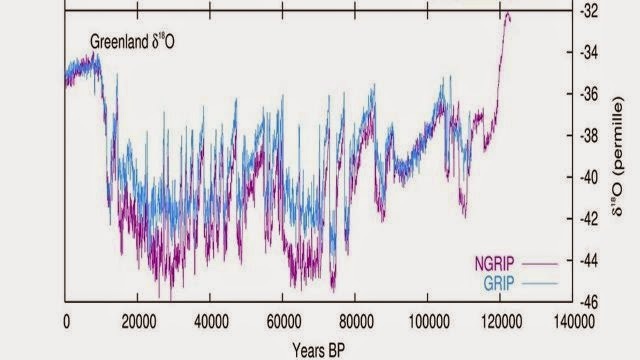 These enormous, rapid oscillations between deep glacial conditions and near interglacial conditions are only possible with the Sun oscillating between its active and inactive states, with the inactive state being the normal state for our Sun for 85% of the last 2 million years. 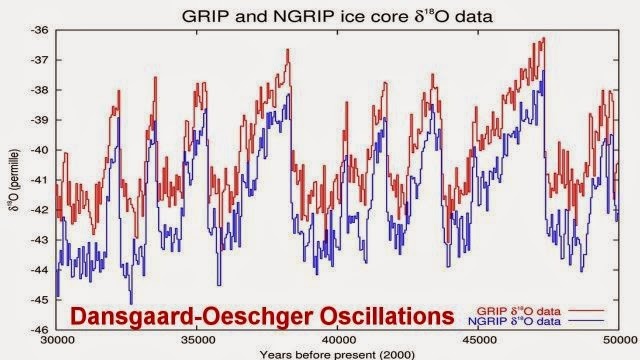 In this context, the Dansgaard Oeschger Oscillations render our currently continuously active Sun, a relatively rare anomaly, that we are about to get back to in a few decades. That the Sun is not alone in assuming an inactive state may be evident the in the existence of a large number of white dwarf stars. This is the type of star that one would expect to see for our Sun, after it goes inactive for long periods, where it remains aglow only by slow nuclear decay of synthesized atomic material that the Sun had retained with its gravity, from its active times, which slowly drift into the interior to be crushed by the gravitational and electric forces in its core. 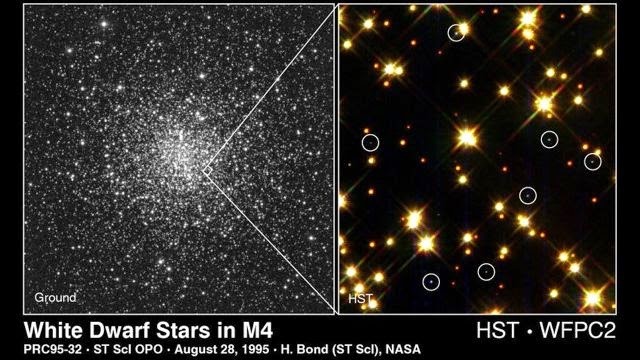 During the initial ice-age transition, as 120,000 years ago, towards a white dwarf star state, our Sun may have gone through several intermediate stages, such as the so-called red-dwarf stage. We really don't know what precisely the sequence would have been. 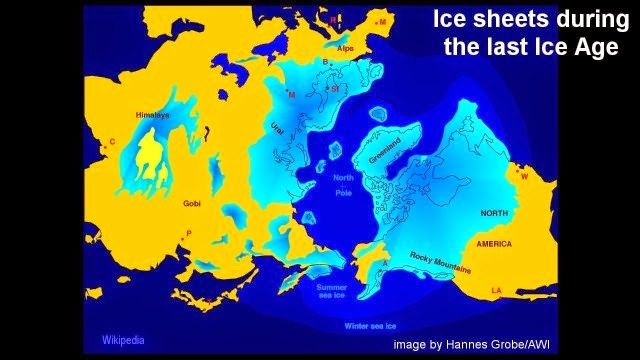 The last Ice Age transition from an interglacial period had occurred 120,000 years ago. No records were kept. Nor do we really know what the type of huge transition means, that is indicated here, when the global climate suddenly gets 40 times colder than the Little Ice Age in 1600s has been, which is barely remembered, but is the only reference that we have available for comparison. Archaeological evidence speaks of severely depressed living conditions occurring all the way through the Ice Ages. 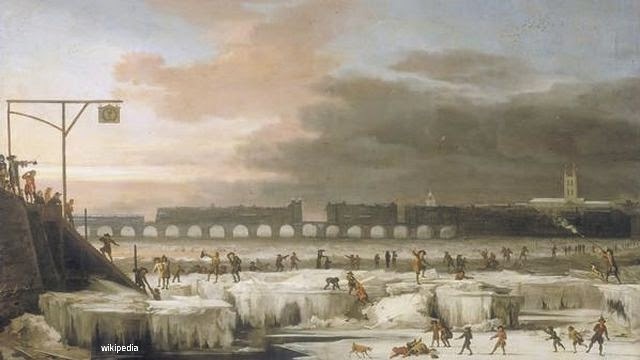 The conditions were evidently so harsh that at the end of the last Ice Age the entire world population had shrunk to a mere 1 to 10 million people. This was the end result, at this time, of more than 2 million years of human development. 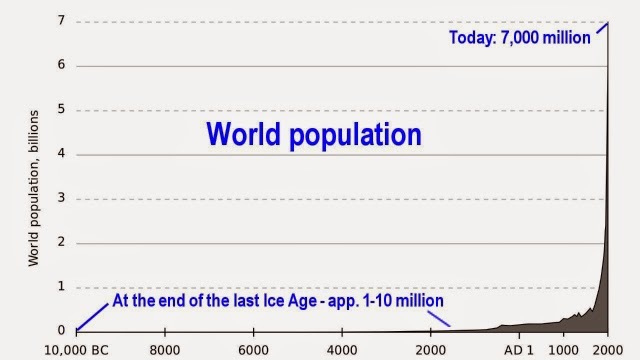 The minuscule population level, following the glaciation period, speaks volumes about the harsh conditions that evidently existed in our world under a mostly inactive Sun, which we call the Ice Ages for the resulting effects. The deep population depression adds one more item of proof that the Sun can and will go inactive, and has done so in the past. Another item of evidence for the Sun being mostly inactive during the Ice Ages, is found in the form of dust accumulation in the ice of Antarctica. The dust accumulations typically begin half-way through the glaciation periods, and extend to the start of the next interglacial period. 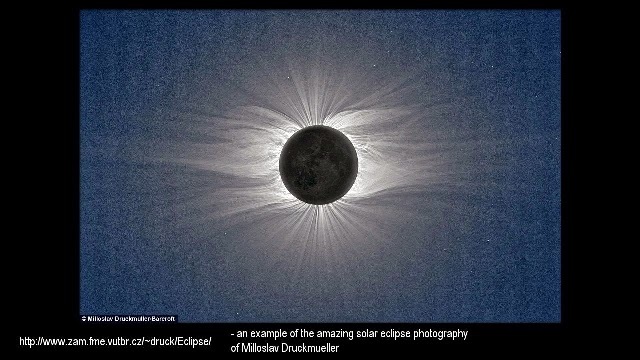 This type of phenomenon is natural for the resulting condition when the main Primer Fields for the Sun, which normally stabilize the orbits of the planets, cease to exist for long periods in which the Sun remains inactive. Under such 'default' conditions, or inactive conditions, the orbits of the asteroids in the asteroid belts, and in near-Earth space, invariably begin to decay. They become disorganized. Asteroids have a large surface to mass ratio and are more readily slowed by external influences. Eventually they begin to bombard the atmosphere of the Earth where they disintegrate into dust. The asteroid intrusion has spanned in previous times more than 40,000 years. In each case it stopped abruptly when the interglacial period began and the orbits became regulated again. 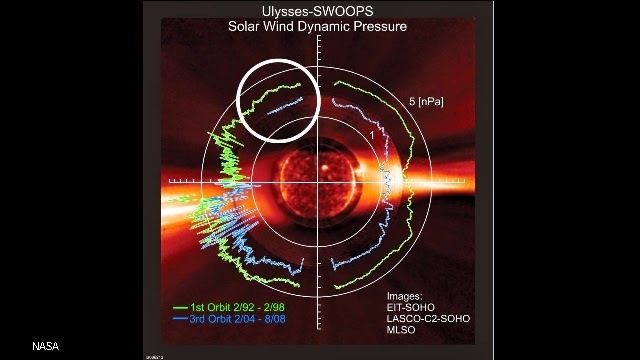 NASA's Ulysses spacecraft saw an amazing decline of the solar wind pressure, by 30% over the span of a decade. It saw a new trend unfolding that is still continuing. 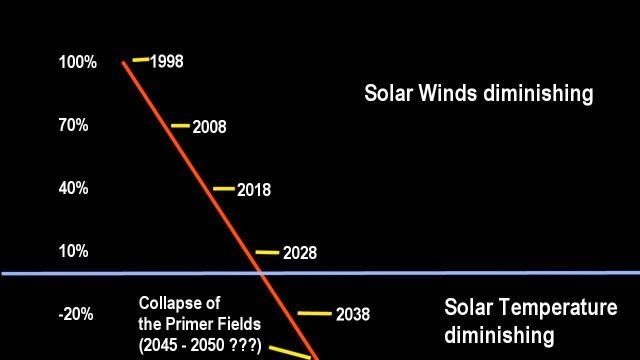 If the trend is projected forward in a linear manner, the solar wind will diminish to zero in the 2030s timeframe. 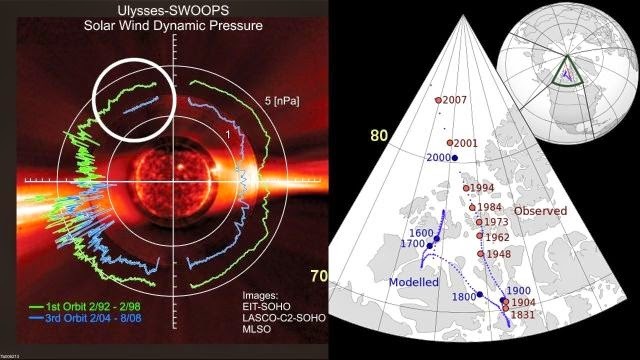 Since the solar wind is a by-product of the regulating system that keeps the Sun at a relatively constant level, the solar-wind cut-off point would mark the beginning of the weakening of the Sun's energy production. The linear continuing of the weakening trend thereafter, would likely lead to the collapse of the Primer Fields in the 2050s timeframe. 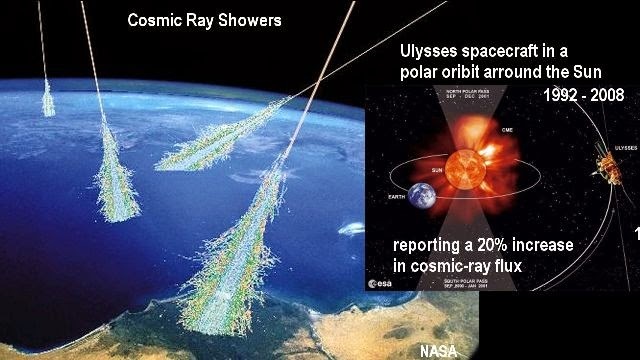 Coincident with the measured weakening of the solar wind pressure, the Ulysses spacecraft had also measured a 30% reduction of the strength of the Sun's underlying magnetic field, and a 20% increase of Galactic Cosmic Ray flux penetrating the barrier provided by the solar heliosphere that weakens with the weaker solar-wind pressure. The weakening of the solar wind has become evident all over the world in the form of a wide variety of meteorological effects. Increased cloudiness is one of the effects. The increased white surface reflects more of the solar radiation back into space, which becomes lost to the heat budget on Earth, with cooling effects in the higher regions of the troposphere in addition to the west policy of climate control inline with UN Agenda 21 population reduction policies using chemtrail as explained in many articles here. 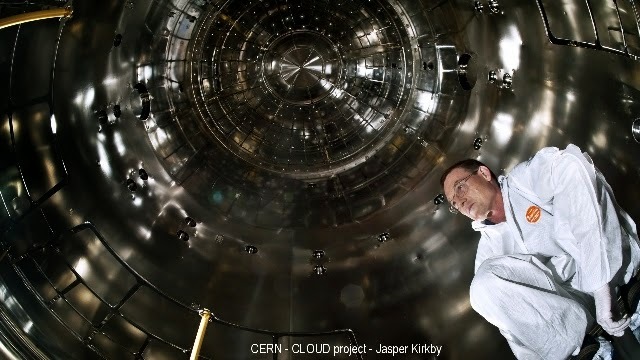 The CLOUD experiment at the European Organization for Nuclear Research, one of the world's largest and most respected centres for scientific research, has demonstrated in principle that cosmic-ray interaction with the atmosphere is enormously effective in increasing cloud nucleation. The measured effects went straight up and off the chart. 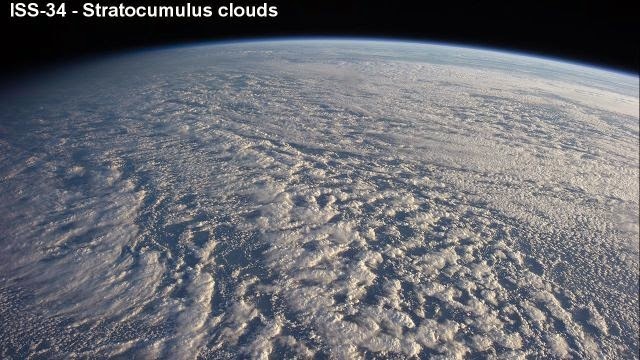 The resulting colder atmosphere reduces the distance of the water transport by the clouds, which results in increased drought condition and loss of agriculture. 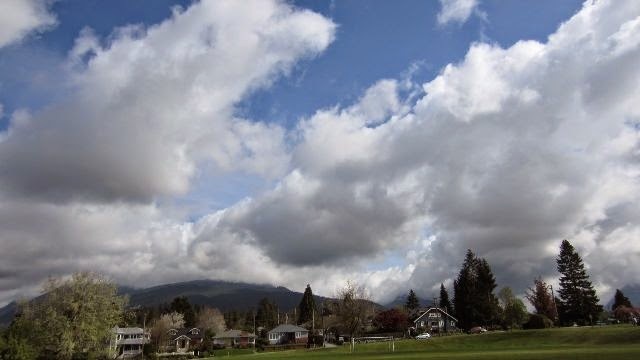 The increased cloud nucleation, of course, reduces the water vapor density, which is the main contributor to the moderating greenhouse effect of the atmosphere, up to 97% of it. With the moderating effect diminishing, we experience larger differences in temperature fluctuations, including colder winters, hotter summers, and ironically also arctic warming during the arctic summers, as the result of the diminished moderating greenhouse. 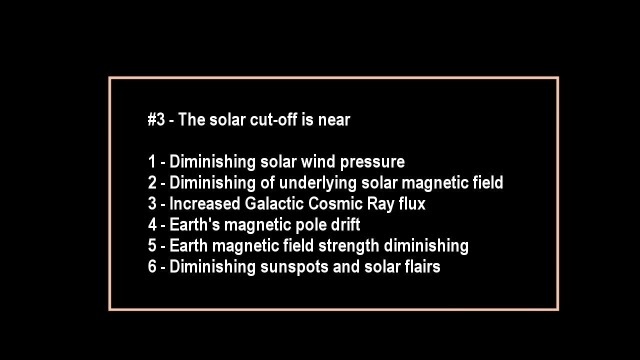 All of these effects are already experienced worldwide, while the continuing trend of the electric weakening of the solar dynamics will cause these experienced 'fringe' effects to become increasingly more severe over the next 30 years. The continued weakening of the plasma system that is powering our Sun, is also directly measurable on the surface of the Earth. It is measured in the form of the reduced deflection of the Earth's magnetic field. Without external influences, the Earth's magnetic field would be aligned with its spin axis. 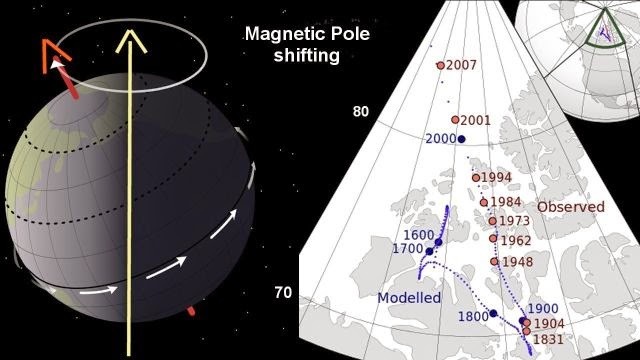 With strong external influences, the magnetic poles become shifted away from the geographic poles by 23 degrees according to the inclination of the spin axis. With the external influence rapidly diminishing, the magnetic pole is drifting back towards its 'normal' spin-axis orientation. While other factors are involved in the observed phenomenon, the indicated patterns seems to suggest the electric weakening of the solar dynamics system is accelerating, instead of remaining linear. The magnetic pole drift is even more ominous when one considers that the Earth magnetic field itself is weakening, and is said to be at its weakest state since records were kept. The effects of the diminished electric solar dynamics are not limited to the Earth alone, but are also evident on the planets. 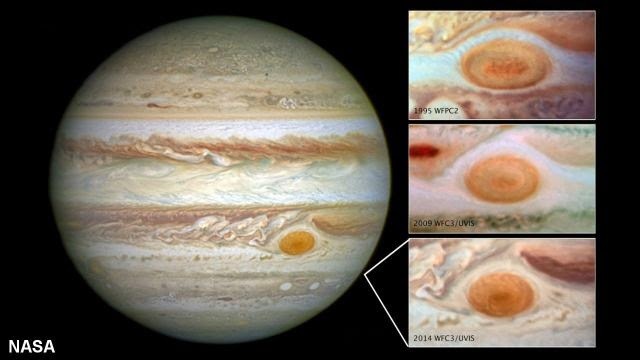 One observed effect is the shrinking of the great read spot on Jupiter that became visibly smaller since the weakening trend began. Another item of evidence that a major weakening trend is in progress, is evident in the solar flair index that is becoming noticeably weaker, since the weakening of the electric solar dynamics began. 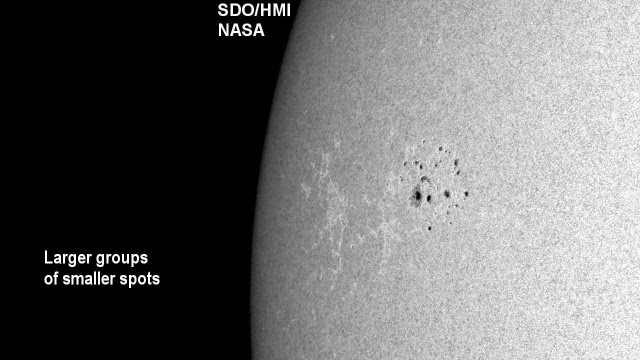 Even the sunspots themselves are getting gradually weaker. The huge spots that blow out massive amounts of internal pressure, are getting fewer, while smaller spots result, that tend to be surrounded by a sea of little spots. It is impossible, of course, to forecast the exact time when the fragile solar dynamics system goes inactive. Nor is this necessary. We know the trends. We understand the principles involved. We know the consequences. And we know what to do to reorganize our world to be able to live with the consequences. But will we do it? 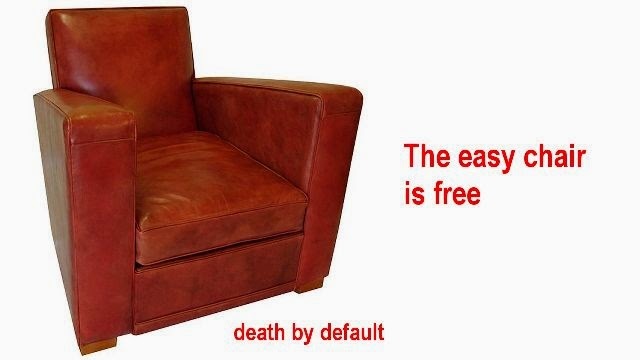 Sure, it is far easier to remain asleep in our chair with the comfortable illusion that the world will grind on forever, as it has since civilization began, especially so as the illusions are supported by scientific assumptions that would make us believe that nothing needs to be done, as the world will grind on forever. 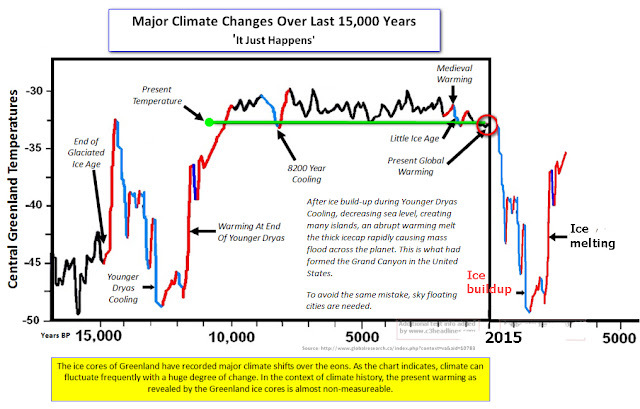 It is this comfortable indifference based on illusions for which no real physical evidence exists, that renders the current Ice Age Challenge the greatest Science Challenge of our time. The Science Challenge is not located in developing the physical means for building the infrastructures for the continued existence of humanity in an Ice Age world. The physical solutions are not difficult to implement in principle, with automated industrial production. But will we do it? 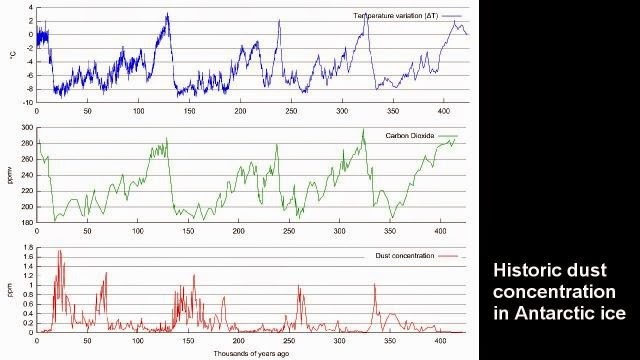 The challenge to science is to get itself and humanity out of the easy chair, and this in time before the Ice Age transition begins, with the Sun going inactive. We have the materials, technologies, and energy resources on hand to build what needs to be built to assure our continued food supply. But will we use these resources? This question makes the Science Challenge also an intimate challenge to ourselves that challenges our attitude towards our children. It is tempting to stay glued to our chair, and to say that the challenge is not ours, that it is in the court of future generations, thousands of years distant. However, the evidence seems to indicate that we are that future generation, so that the ball is in our court. In fact we should celebrate that the ball is in our court, because we need the science breakout to what is real, because we are fast running out of energy resources, while ignoring the anti-entropic energy resources that we have within the electrically powered universe and solar system. 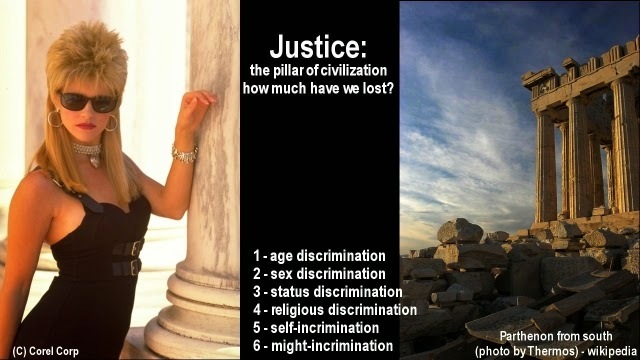 The development of our civilization has been relatively short, spanning roughly 6000 years. In the last 200 years of it, we began the large-scale energy use. During this brief span, our entropic energy resources have already been largely depleted. Some say we have only 60 years of oil left at the current rate of consumption, and maybe 400 years for nuclear energy. Then what? 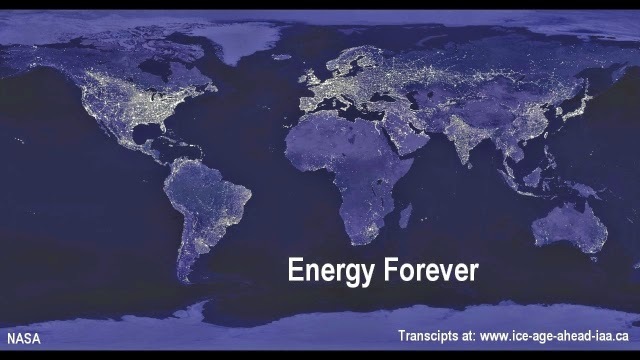 On the larger scene, with Ice Ages lasting for 90,000 years, it does not really matter whether we run out of oil in 60 years or in 1000 years, we need an anti-entropic energy source to have an endless future. 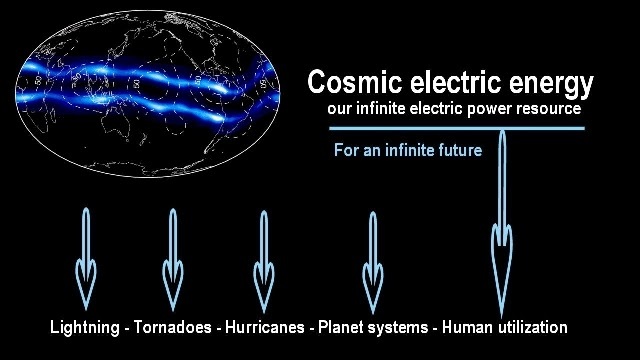 We have no real option left, even now, not to develop the cosmic electric energy resources that can never be depleted, which promise to be sufficient to meet our relatively minuscule human needs, for all times to come, even in solar inactive times when the interstellar plasma streams have a wider focus. The Science Challenge definitely includes, to get us moving into the cosmic-energy direction as well. 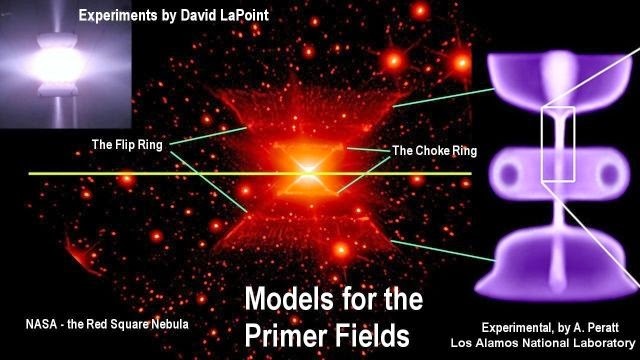 The cosmic-energy development, and Ice Age infrastructure development, are both elements of a single, global Science Challenge that no nation on the planet is exempted from. On this platform the challenge will be met as one of the most urgent common needs of all mankind, by which we stand united as one people of a single, universal, humanity.